Wavecrest Surf School was started in Jeffreys Bay in 2005 and has been going strong ever since. Situated on Jeffreys Bay's main beachfront near many restaurants and good chilling spots, the atmosphere is awesome! Just jump out of your car, meet Andrew and run into that beautiful ocean to start your life changing surfing lesson! Surfing lessons are professionally set up to teach you all you need to know to get you on your way. It's an unforgettable experience with guaranteed fun... and where better to learn to surf than the world-renown Jeffreys Bay! Our surf instructors have years of experience showing people how to surf safely and have a great time. Combining a true authentic J Bay experience and lifestyle they make your learn to surf experience something you will remember for life. 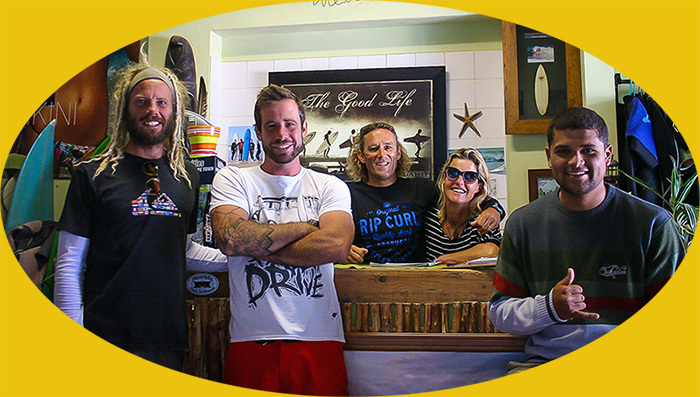 Meet Andrew and Libby Moon and the bros responsible for making your surfing lessons fun and safe. We'll teach you the ABC of surfing. Learn about safety, how to catch a wave, balance and how to stand up. This step by step process really works! *Wetsuit and board rental also available. After you’ve had some fun, you get your hands on discount vouchers for local restaurants, takeaways and surf-shops... as well as stickers and posters! Need help finding your first surf-board and wetsuit? Get all the advice you need and a trip to the shops to boot! Good times in J Bay ! Jeffreys Bay is a very unique little town, once a small fishing village until a couple of hippy surfers discovered the perfect waves in the early 60’s. Surfers used to travel from far to ride the empty waves and sleep and camp in the sand dunes. Today Supertubes is known around the world as one of the best waves in the world, where once a year the Billabong Pro Contest is held in July, this is part of the World Surfing Tour (ASP). Since the hippy days Jeffreys has grown into a bustling tourist destination, filled with surf shops, restaurants and bars, with the beautiful beaches and ocean life it is a great place to visit on your trip along the coast. Many people come here just to learn to surf and go mad in the many factory shop outlets... shop, shop, shop til you drop! The main beach or dolphin beach is ideal for beginner surfing. There are many board shapers here and it is a great place to have a board made personally for you. Visit these guys and see what they do - it's an interesting way to spend the day when the ocean is flat. Visit the Surf Museum... wander around at your leisure, to see how the town was in the old days... and check out those old school boards! !